Just a few of the ridiculous sale items on net-a-porter.com right now! And here you were thinking, "Surely these sales can't get any steeper than they already are. I should just go ahead and buy that designer dress now before it actually sells out." But wait! There's more! 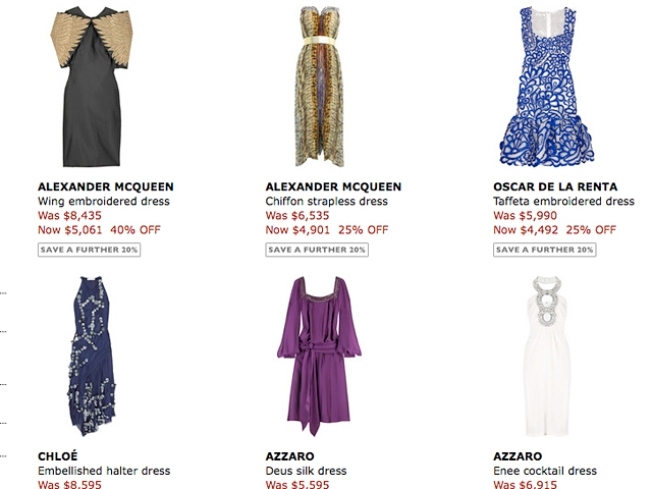 In an e-mail blast this morning, thousands of happy net-a-porter shoppers discovered that the online mega-site is offering an extra 20 percent off all their already marked-down sale items. Granted, in a world where eLuxury is closing (albeit for non-economy-related reasons, though we're skeptical), all online stores should really be going all-out in soliciting shoppers right now, but still. That's, like, 70 percent off in some cases, like for example this crazy-hot fringed halter dress by 3.1 Phillip Lim. Alas, our ultimate fancy item—a strapless chiffon dress by Alexander McQueen—is only 25 percent off (and still, ahem, almost $5K, but hey, we can dream. Just enter promo code "WINTERUSA" at checkout from now until January 18 to take advantage of the deal. We certainly are.